Welcome back to the In-App Purchase Inspector – our regular look at free-to-play games from the consumer's perspective. The end goal is to see whether the game makes a good enough case for us to part with our cash, or whether players are content – or engaged enough – to 'freeload'. This time we're taking a look at Lords Mobile, the 2016 strategy game from IGG. Since its launch, the game has been a regular presence in the top-grossing charts. IGG was named 19th in PocketGamer.biz's list of Top 50 Mobile Game Developers for 2017. Singapore-based developer IGG understands how to find success with mobile strategy games. The first example of this was Castle Clash, which beat Supercell to the punch by launching before Clash of Clans on Android. This gave IGG a solid base from which to build, and remains a key game. Lords Mobile balances elements of MZ's games with the appeal of watching battles unfold. But by 2016, MZ had ushered in a different breed of strategy game – menu-heavy, aggressively marketed and monetised – to dominate the mobile market. IGG then launched Lords Mobile, a game that balances these elements with the appeal of actually watching battles unfold. It's been a top-grosser ever since. To say that Lords Mobile is an experience like Game of War or Mobile Strike is to capture just one element of a multi-layered experience that takes inspiration from a number of games and genres, but the comparison is a fair one. It features a number of quests that in real terms consist of nothing but wait timers, and can be skipped using either Speed-Up Tokens or hard currency. Then there's the focus on Guilds and cooperation as an extra metagame hook. More broadly, there's also the similarity that much of the game revolves around generating and reinvesting numerous resources in an ever-expanding base. But while MZ focuses solely on these things, IGG has opted to add more action to Lords Mobile. In-game battles, while not directly controlled, are fought in real time between two fully 3D armies. Hero Mode plays more like Summoners War. Then there's the unexpected addition of Hero Mode, which focuses on leader units in stages more familiar to RPGs like Summoners War, adding its own levelling and progression systems for these units based around item drops. Naturally, then, the game's monetisation is also built around familiar ideas first and foremost. The game makes no secret of wait timers being its bread and butter, and skipping these is the primary function of hard currency Gems. Gems come in bundles ranging from $1.99 for 280 to $99.99 for 22,000, but you have to scroll a long way to find these regular prices. This is because the shop page is dominated by one-time offers of various shapes and sizes. This kind of retailing is an approach that MZ has also used heavily, but it's to IGG's credit that it's nowhere near as intrusive here. Splash offer screens rarely interrupt play in the frustrating way that they dominate an average session of Final Fantasy XV: A New Empire, the deals mostly kept aside for those who care to check them. It helps, too, that the deals are rather good. This is a game that understands the art and psychology of the IAP starter pack. One such bundle offers 2,000 Gems for $4.99 – more than double the usual rate – as well as several resources, but expires quickly to encourage a fast sale. Another features a total of 10,500 Gems, hundreds of Speed-Up Tokens and plenty of other resources but releases them over a period of 30 days. Annuities provide an added incentive for players to keep returning. Known as annuities, this kind of offer provides an added incentive for a player to keep returning in those crucial early days. For a player, there's also appeal in getting multiple pay-offs for a single purchase. 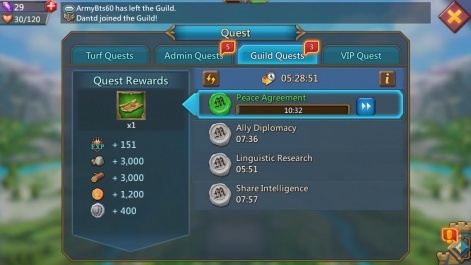 The pace of Lords Mobile is the same as most mobile strategy games: a healthy portion of hard currency is gifted to race through the early stages (in this case 200 for starting the game and 400 for joining a guild) with the game then slowing down significantly. But it has to be said, the game feels nowhere near as stingy or pushy as MZ's games. 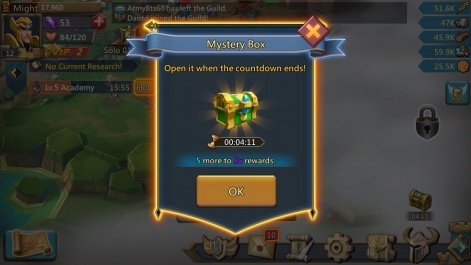 Hard currency gifts are rare, but a Mystery Box that unlocks several times per hour and offers free resources of various kinds is refreshingly in its frequency. But while not ostensibly related to monetisation, Lords Mobile really benefits from having more than one string to its bow; a wait timer becomes not an invitation to either quit or pay up, but can be an opportunity to launch an attack or play through some stages in Hero Mode. In short, while it's impossible to deny they play some part in a game with so many wait timers, Lords Mobile isn't over-reliant on monetising boredom or frustration. And that, for most players, is all we ask. Is this article about IGG and Lords Mobile, or about the smoke and mirrors sweatshop named MZ? It seems MZ is mentioned and referred to more than the maker of the game this article was supposed to be about. Why does this publication and it's affiliates continue to polish the brass of that rapidly sinking rat infested ship? 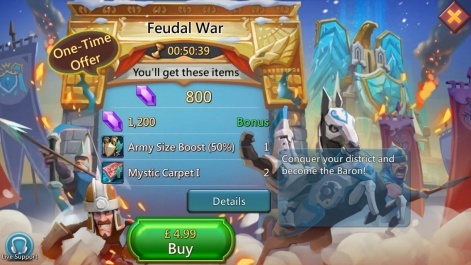 As far as Lords Mobile is concerned, it is hands down better than any of the low quality design, bug riddled, and unstable MZ products; just ask any of the player base for the MZ Pay 2B Loser scams - oh wait, you can't... because the vast majority of gamer's that had even the slightest bit of sense recognized the scams for what they were and jumped off that sinking ship a long time ago. Did... Did MZ hurt you? Show me on the doll where MZ hurt you.